Firewood should have 20% moisture content or less when burned or a large amount of heat generated from burning the wood is used to dry the wood as it burns. Burning wet firewood is inefficient, because you will need to have more firewood, harvest more of the resource, wear out your wood cutting equipment and your wood stoves faster and wet wood increases creosote buildup in the chimney. The easiest method to dry firewood is to split it, stack it and cover the top (not the sides) with boards or a tarp to deflect rain and snow from the stacked wood. Firewood should be cut to length based on the length of the firebox. Firewood should be split prior to burning to increase the temperature of the firebox and create a more complete burn. 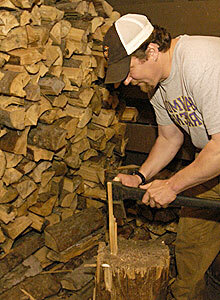 Generally firewood should be split so the face of the firewood is no more than six inches across. The smaller the pieces the hotter the fire and the more complete the burn. Firewood should not be stacked beside the house or any other structure as it may introduce wood decay organisms (insects and fungi) into the structure and it may become a hazard difficult to extinguish if it catches on fire due to embers from wildfire. Don't stack firewood or building materials right next to the house. Regularly monitor stacked firewood for carpenter ants and other insects, especially if the firewood came from insect killed trees. Research done by the Cold Climate Housing Research Center (CCHRC) on drying firewood in Interior Alaska, indicates a good time to harvest is late winter and early spring. Their research showed that cut firewood immediately split, stacked and covered on top will cure and dry to 20% moisture content or less, making it ready to burn the fall of that year. Firewood cut in regions with more rain and wind may need a woodshed that is covered on all sides and it may take more than a year to dry out the moisture within it, creating seasoned dry firewood. In cool maritime areas the firewood should be placed on small poles or boards to keep it off the wet ground. The USDA Forest Products Laboratory has several publications on firewood storage and insect pests. Use firewood cut within 50 miles of where it is burned to help prevent transport of wood decay organisms into the area. Bring firewood into the house the day or day before it will be burned. Firewood should not be stored in the house. Never burn wood treated with pesticides, including wood preservatives. Wood ash contains calcium carbonate (about 25%) and potash (less than10%). Both calcium carbonate and potash supply essential plant nutrients and will raise the soil pH when wood ash is added to the soil. It is impossible to state how much wood ash is safe to add to garden soil but 20 pounds of wood ash per 100 square feet should not create a problem. Carefully monitor the soil pH to prevent excessively high soil pH where wood ash is disposed. Do not use wood ash around acid loving plants like rhododendrons, azaleas, blueberries and potatoes.